^ Hickey, M.; King, C. The Cambridge Illustrated Glossary of Botanical Terms. Cambridge University Press. 2001. ^ N.B. 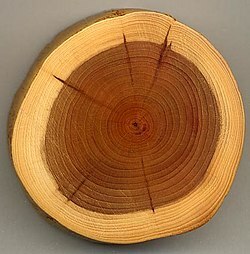 fossils show origins of wood. CBC.ca. 2011-08-12 [2011-08-12]. ^ Briffa, K.; Shishov, V.V. ; Melvin, T.M. ; Vaganov, E.A. ; Grudd, H.; Hantemirov, R.M. ; Eronen, M.; Naurzbaev, M.M. Trends in recent temperature and radial tree growth spanning 2000 years across northwest Eurasia. Philosophical Transactions of the Royal Society B: Biological Sciences. 2008, 363 (1501): 2271–2284. PMC 2606779. PMID 18048299. doi:10.1098/rstb.2007.2199. ^ Jean-Pierre Barette, Claude Hazard et Jérôme Mayer. Mémotech Bois et Matériaux Associés. Paris: Éditions Casteilla. 1996: 22. ISBN 27135-1645-5. ^ W. Boerjan, J. Ralph, M. Baucher. Lignin biosynthesis. Ann. Rev. Plant Biol. June 2003, 54 (1): 519–549. PMID 14503002. doi:10.1146/annurev.arplant.54.031902.134938. ^ Mimms, Agneta; Michael J. Kuckurek; Jef A. Pyiatte; Elizabeth E. Wright. Kraft Pulping. A Compilation of Notes. TAPPI Press. 1993: 6–7. ISBN 0-89852-322-2. ^ Fiebach, Klemens; Grimm, Dieter. Resins, Natural. Ullmann's Encyclopedia of Industrial Chemistry. 2000. ISBN 978-3-527-30673-2. doi:10.1002/14356007.a23_073. ^ ProfessionalNetSolutions.com. The Millennium Clock Tower at Edinburgh Royal Museum. Freespace.virgin.net. [2011-12-15]. （原始内容存档于2012-02-27）. Hoadley, R. Bruce. Understanding Wood: A Craftsman’s Guide to Wood Technology. Taunton Press. 2000. ISBN 1-56158-358-8.